Phase 1: Completed and Fully Funded. No doubt you’ve noticed the repainted lobby and the new furniture and decorations. 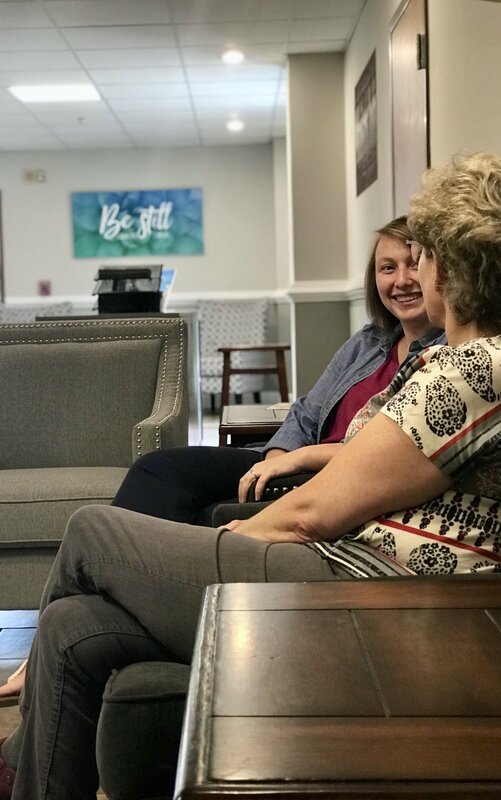 And our new Connect Room is becoming the place where regulars can grab a cup of coffee before Sunday school and where guests can get some one-on-one time with Pastor Jim after the service. 1. Storage Building ($8,000): We had to temporarily relocate our men’s Sunday school class when we turned a room that was used for storage into our Connect Room. Our men have graciously endured their cramped quarters, but they need their classroom back. For $8k, we can add a connected storage area to our Fellowship Hall—and move the storage items out of the men’s classroom. 2. Youth Area ($5,000): Our Student Ministry area needs several upgrades to replace worn furniture and equipment and to increase the functionality of the space. 3. Interior Painting ($3,000): Our volunteer painters are rested up from their earlier painting projects, and they’re ready to get back to work. Around $3k is needed to buy materials for this hardy band of souls. 4. Exterior Improvements ($4,000): First impressions are lasting impressions—and we definitely have some work to do on our parking lot, median/curb areas, sidewalks, and landscaping.